What Goes On - ZineWiki - the history and culture of zines, independent media and the small press. What Goes On was a fanzine devoted to the Velvet Underground. Created by Philip Milstein, it was published out of Amherst, Massachusetts, U.S.A., in the late 1970's. The cover of Issue one, released in 1978, features Maureen Tucker. This 8 page issue features articles by Philip Milstein, Joseph Allen Viglione and M.C. Kostek. Included in the zine are photos of Velvet Underground members Lou Reed, Maureen Tucker, and an autographed photo of Nico; an article on rare Velvets record and tape releases; an account by M.C. Kostek of seeing the Velvets playing at the Woodrose Ballroom in South Deerfield, Massachusetts, when the author was 16, with reprints of the show posters, later reprinted in Up-tight | The Velvet Underground Story book by Victor Backris & Gerard Malanga; an article on following Lou Reed around from his concert to his hotel room to a restaurant, and then, another day, to another concert; and a piece called "A Quiet Devotional" dedicated to Maureen Tucker by editor Milstein. Issue 2, published June 1979, was 24 pages, and focused on the Velvet Underground discography, including compilations, bootlegs, and cover versions. It has also rare photos by The Modern Printer shot at a December 1968 show at The Boston Tea Party. Issue 3 appeared in 1982 (with a second printing in 1983), and was 52 pages. It featured articles such as the Angus MacLise story, interviews with Andy Warhol, Nico, Tony Conrad, and an unreleased review of Nico's Marble Index by Lester Bangs. 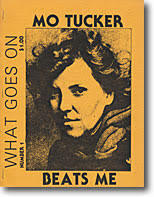 Issue 4 was released in 1990, and was 80 pages, focussing on Moe Tucker and featuring a 2-part extensive interview with Moe. It also covers the 1990 Fondation Cartier reunion and has full VU-member updates. It came with a free flex disc, Thanks Andy Warhol. Issue Number 5 was published September 1996 and focusses on "The Velvet Underground Live and Wild 1965-1993", featuring rare photos, firsthand accounts from the 60s and full coverage of the 1993 reunion tour with show and record reviews. Contributors included writers Philip Milstein, Joseph Allen Viglione and M.C. Kostek, photographer Gina Star, and cartoonist Dan Guidera. This page was last modified on 18 August 2018, at 15:05.